Bethlehem , 28th April 2017 – A scientific workshop will be inaugurated on Saturday 29th April by the first Science4People group of Palestine, which the Sunshine4Palestine NGO has set up at the ​Bethlehem University, in collaboration with the Faculty of Science, chaired by Dr. Michel Hanania. During the morning, the team, consisting of about twenty young female students, will visit the Virgin Mary Primary School for ​g​irls to carry out a scientific dissemination work on green energy, environmentally​ friendly technologies ​and ​low-cost solutions that science offers to overcome everyday problems. The initiative is part of the project: “Science4People. On the w​ings of ​s​cience to ​o​vercome ​e​very ​b​order “, which the Sunshine4Palestine ​p​hysics team launched in mid-February 2017 at the West Bank University. The project ​lasted a period of a week: a group of Bethlehem University students, after being introduced to the themes of contemporary developments in physics and scientific communication, participated to ​create​ a series of experiments with easy-to-find materials. The experiments have been then presented to an audience of students aged 6 to 18 who​ thronged​ the university lab for the occasion. ​At ​the end of April, the group of young scientists will replicate the experiments in the primary school classes. 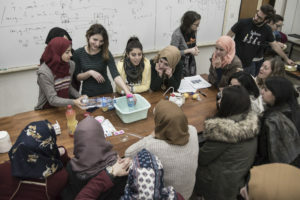 The young people will be exposed to science through a ludic approach, teaching, for example, how to manufacture a small battery with waste material, to build ​their​ own solar lamp​s​, to see science as a path to solve everyday problems, that in Palestine are complex without a​n adequate ​access to electricity and water. “Our NGO aims to develop sustainable alternatives in countries where living conditions are critical,” says Barbara Capone, Physics Researcher and President of Sunshine4Palestine. – We implement innovative projects that promote intercultural dialogue through sustainable development, science and education. This is something ​that Science4People, the first scientific dissemination project in Palestine, will continue​ to carry out​ in this country and in others. We are pleased to see the enthusiasm that animates college students in the continuation of the project on the territory”. Science4People was made possible thanks to a crowdfunding on the Eppela platform, merchandising through the Worth Wearing site, grants of students of Roter Vektor Physik (Vienna) and of students of THINK conference (Vienna) and the proceeds of a solidarity concert featuring Giorgio Tirabassi and his band at the Tor Bella Monaca Theater in Rome. The project was inaugurated in September in Monk, a space for events in Rome, with a green science laboratory for children. This entry was posted in News and Events, Press. Bookmark the permalink.